John Robert Fowles (/faʊlz/; 31 March 1926 – 5 November 2005) was an English novelist of international stature, critically positioned between modernism and postmodernism. His work reflects the influence of Jean-Paul Sartre and Albert Camus, among others. After leaving Oxford University, Fowles taught English at a school on the Greek island of Spetses, a sojourn that inspired The Magus, an instant best-seller that was directly in tune with 1960s "hippy" anarchism and experimental philosophy. This was followed by The French Lieutenant's Woman (1969), a Victorian-era romance with a postmodern twist that was set in Lyme Regis, Dorset, where Fowles lived for much of his life. Later fictional works include The Ebony Tower, Daniel Martin, Mantissa, and A Maggot. Fowles's books have been translated into many languages, and several have been adapted as films. Fowles was born in Leigh-on-Sea in Essex, England, the son of Gladys May Richards and Robert John Fowles. Robert Fowles came from a family of middle-class merchants of London. Robert's father Reginald was a partner of the firm Allen & Wright, a tobacco importer. Robert's mother died when he was six years old. At the age of 26, after receiving legal training, Robert enlisted in the Honourable Artillery Company and spent three years in the trenches of Flanders during the First World War. Robert's brother Jack died in the war, leaving a widow and three children. During 1920, the year Robert was demobilised, his father Reginald died. Robert became responsible for five young half-siblings as well as the children of his brother. Although he had hoped to practise law, the obligation of raising an extended family forced him into the family trade of tobacco importing. Gladys Richards belonged to an Essex family also originally from London. The Richards family moved to Westcliff-on-Sea in 1918, as Spanish flu swept through Europe, for Essex was said to have a healthy climate. Robert met Gladys Richards at a tennis club in Westcliff-on-Sea in 1924. Though she was ten years younger, and he in bad health from the war, they were married a year later on 18 June 1925. Nine months and two weeks later, Gladys gave birth to John Robert Fowles. New College, Oxford, where Fowles attended university. Fowles spent his childhood attended by his mother and by his cousin Peggy Fowles, 18 years old at the time of his birth. She was his nursemaid and close companion for ten years. Fowles attended Alleyn Court Preparatory School. The works of Richard Jefferies and his character Bevis were Fowles's favourite books as a child. He was an only child until he was 16 years old. In 1939, Fowles won a place at Bedford School, a two-hour train journey north of his home. His time at Bedford coincided with the Second World War. Fowles was a student at Bedford until 1944. He became head boy and was an athletic standout: a member of the rugby-football third team, the fives first team, and captain of the cricket team, for which he was a bowler. After leaving Bedford School in 1944, Fowles enrolled in a Naval Short Course at Edinburgh University and was prepared to receive a commission in the Royal Marines. He completed his training on 8 May 1945—VE Day and was assigned instead to Okehampton Camp in the countryside near Devon for two years. After completing his military service in 1947, Fowles entered New College, Oxford, where he studied both French and German, although he stopped studying German and concentrated on French for his BA. Fowles was undergoing a political transformation. Upon leaving the marines, he wrote, "I ... began to hate what I was becoming in life—a British Establishment young hopeful. I decided instead to become a sort of anarchist." It was also at Oxford that Fowles first considered life as a writer, particularly after reading existentialists such as Jean-Paul Sartre and Albert Camus. Fowles has also commented that the ambience of Oxford at the time, where such existentialist notions of "authenticity" and "freedom" were pervasive, influenced him. Though Fowles did not identify as an existentialist, their writing was motivated from a feeling that the world was absurd, a feeling he shared. Fowles spent his early adult life as a teacher. His first year after Oxford was spent at the University of Poitiers. At the end of the year, he received two offers: one from the French department at Winchester, the other "from a ratty school in Greece," Fowles said: "Of course, I went against all the dictates of common sense and took the Greek job." In 1951, Fowles became an English master at the Anargyrios and Korgialenios School of Spetses on the Peloponnesian island of Spetses (also known as Spetsai). This opened a critical period in his life, as the island was where he met his future wife Elizabeth Christy, née Whitton, wife of fellow teacher Roy Christy. Inspired by his experiences and feelings there, he used it as the setting of his novel, The Magus (1966). Fowles was happy in Greece, especially outside the school. He wrote poems that he later published, and became close to his fellow expatriates. But during 1953, Fowles and the other masters at the school were all dismissed for trying to institute reforms, and Fowles returned to England. On the island of Spetses, Fowles had developed a relationship with Elizabeth Christy, then married to another teacher. Christy's marriage was already ending because of Fowles. Although they returned to England at the same time, they were no longer in each other's company. It was during this period that Fowles began drafting The Magus. His separation from Elizabeth did not last long. On 2 April 1957, they were married. Fowles became stepfather to Elizabeth's daughter from her first marriage, Anna. For nearly ten years, Fowles taught English as a foreign language to students from other countries at St. Godric's College, an all-girls establishment in Hampstead, London. The success of his novel meant that Fowles could stop teaching and devote himself full-time to a literary career. The Collector was also optioned and was adapted as a feature film of the same name in 1965. Against the counsel of his publisher, Fowles insisted that his second book published be The Aristos, a non-fiction collection of philosophy essays. Afterward, he set about collating all the drafts he had written of what would become his most studied work, The Magus, based in part on his experiences in Greece. In 1965 Fowles left London, moving to Underhill, a farm on the fringes of Lyme Regis. Dorset. The isolated farm house became the model for The Dairy in the book Fowles was writing: The French Lieutenant's Woman (1969). Finding the farm too remote, as "total solitude gets a bit monotonous," Fowles remarked, in 1968 he and his wife moved to Belmont, in Lyme Regis. (Belmont was formerly owned by Eleanor Coade), which Fowles used as a setting for parts of The French Lieutenant's Woman. In this novel, Fowles created one of most enigmatic female characters in literary history. His conception of femininity and myth of masculinity as developed in this text is psychoanalytically informed. In the same year, he adapted The Magus for cinema, and the film was released in 1968. The film version of The Magus (1968) was generally considered awful; when Woody Allen was later asked whether he would make changes in his life if he had the opportunity to do it all over again, he jokingly replied he would do "everything exactly the same, with the exception of watching The Magus." The French Lieutenant's Woman (1969) was released to critical and popular success. It was eventually translated into more than ten languages, and established Fowles' international reputation. It was adapted as a feature film in 1981 with a screenplay by the noted British playwright (and later Nobel laureate) Harold Pinter, and starring Meryl Streep and Jeremy Irons. Fowles lived the rest of his life in Lyme Regis. His works The Ebony Tower (1974), Daniel Martin (1977), Mantissa (1981), and A Maggot (1985) were all written from Belmont House. Fowles was named by The Times newspaper of UK as one of the 50 greatest British writers since 1945. In 1998, he was quoted in the New York Times Book Review as saying, "Being an atheist is a matter not of moral choice, but of human obligation." Fowles composed a number of poems and short stories throughout his life, most of which were lost or destroyed. In December 1950 he wrote My Kingdom for a Corkscrew. For A Casebook (1955) was rejected by various magazines. In 1970 he wrote The Last Chapter. Joining the community, Fowles served as the curator of the Lyme Regis Museum from 1979 to 1988, retiring from the museum after having a mild stroke. Fowles was involved occasionally in politics in the town. He occasionally wrote letters to the editor advocating preservation. Despite this involvement, he was generally considered reclusive. In 1990, his first wife Elizabeth died of cancer, only a week after it was diagnosed. Her death affected him severely, and he did not write for a year. In 1998, Fowles married his second wife Sarah Smith. With Sarah by his side, Fowles died of heart failure on 5 November 2005, aged 79, in Axminster Hospital, 5 miles (8.0 km) from Lyme Regis. In 2008, Elena van Lieshout, a former girlfriend of Fowles, presented a series of 120 love letters and postcards for auction at Sotheby's. The letters start in 1990, when Fowles was aged 65. Elena, a young Welsh admirer and a student at St. Hilda's College, Oxford, contacted the reclusive author and they developed a sensitive relationship. ^ a b c Guttridge, Peter (8 November 2005). "John Fowles". The Independent. Retrieved 24 October 2014. ^ "The 50 greatest British writers since 1945", The Times, . 5 January 2008.Retrieved on 19 February 2010. ^ The New York Times, 31 May 1998. ^ Goosmann, Bob. "Biography of John Fowles". John Fowles The Website. Retrieved 24 October 2014. ^ Higgins, Charlotte. "Reclusive novelist John Fowles dies at 79". The Guardian. Retrieved 24 October 2014. ^ Sotheby's. "Lot 26, John Fowles" (PDF). Retrieved 24 October 2014. ^ Adams, Stephen. "John Fowles' Love letters to Student Sell for 25,000". The Telegraph. Retrieved 24 October 2014. "Writer John Fowles dies aged 79", BBC News, 7 November 2005. "The Novels of John Fowles: A Reassessment", Fractious Fiction, November 6, 2015. Adam Lee-Potter, Interview: "Fair or Fowles? ", The Observer, 12 October 2003. 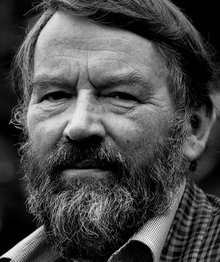 The Guardian Book Authors: John Fowles – Biography, list of articles and interviews at The Guardian, 22 July 2008. Fowles in Dorset BBC Radio 4: Chris Ledgard explores a series of previously unheard recordings of the novelist John Fowles at work during his time as the curator of Lyme Regis Museum. 28 October 2008.